Remains To Be Seen is a short film celebrating the particular skills and attributes of the older dancer, featuring compelling, moving and intimate images set by the sea, the weathered exteriors of Caerphilly Mountain and the atmosphere interiors of Cardiff’s Victorian architecture. Imprinted in our bodies and creating an inner and outer landscape is the map of our life’s experience. This experience and the passage of time inform our being and tell of the person we have become. As older performers we draw on this inner landscape to offer something rich and unique – something very different from the athleticism and bravado of the younger dancer. 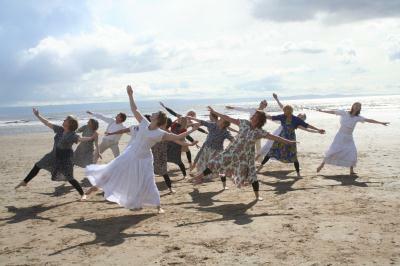 Striking Attitudes’ film ‘Remains To Be Seen’ tells of times past, times remembered and times to come. It evokes images of the journey from innocence to knowledge, our human frailty and an increasing awareness of our fragile mortality and contrasts these with our continuing quest to find ways and means to remain potent beings who still have a voice in our youth obsessed culture. 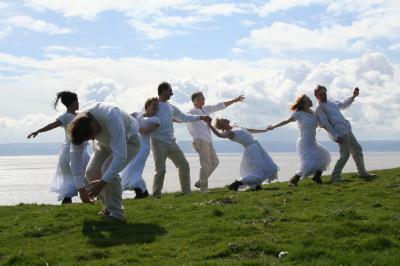 8 professional dancers and 10 community dancers, age 42 to 75 took part in the making of ‘Remains To Be Seen’. Alongside the highly experienced professional dancers were some dancers from the community who had never danced before in their lives. The professional film crew Wyndham Price, Zoran Veljkovic, Chris Buxton, Luke Jacob and Oanis Rawbone had several community film – makers working alongside them, who helped film footage for the documentary about making of the film. 19 community film-makers took part in two film-making workshops with film director Wyndham Price. ‘Remains To Be Seen’ was filmed on location at the Norwegian Church in Cardiff Bay, in a Victorian house in Roath, Cardiff, in the rain on Caerphilly Mountain, the sun at Dyffryn Gardens and the snow at Southerndown beach in the Vale of Glamorgan. ‘Remains To Be Seen’ was created for the Gwanwyn Festival 2008 with the support of Arts Council of Wales, Film Agency for Wales, NIACE, Age Concern Wales, and Dyffryn Gardens. ‘Remains To Be Seen’ featured the professional ghost dancers Caroline Bruce, June Campbell- Davies, Dylan Davies, Janet Fieldsend (assistant choreographer and rehearsal director), Nigel Gilvier, Russell Gomer, Miranda Knight and Frank Rozelaar-Green. The women in floral dresses were community dancers Carol Brown, Linda Bullock, Liz Harris, Geraldine Hurl, Olivia Jones, Jill Kirkpatrick, Karen LeBeau, Dilys Price, Shirley Stansfield and Diane Stanton. DVD copies of ‘Remains To Be Seen’ and the documentary of the making of ‘Remains To Be Seen’ can be purchased from Striking Attitudes for a cost of £15.00 including postage and packing (within the UK). Copies of ‘Remains To Be Seen’ can be loaned for a cost of £10.00 including postage and packing (within the UK).